Please make a note to update any address changes on Raiderlink (MyTech), with the Foundation in the Scholars Portal, and with the coordinators on campus. It is vital to maintain a current local mailing address (in Lubbock) so you will receive timely information about activities, deadlines, opportunities, and policies applying to Terry Scholars. We also strongly encourage you to routinely check your TTU email address. The Terry Program will only send information to the Texas Tech email address, and we will consider that you have received the information contained in those mailings. As you prepare for advising, you will look at course offerings. The university posts course offerings on MyTech at www.raiderlink.ttu.edu . Keep in mind all students who were enrolled at Tech this spring have already registered for courses, so not every class will be available. As you will see, each course has a designation of four, three, or two letters (called a prefix). For example, the prefix for math courses is MATH, the prefix for history courses is HIST, and the prefix for English courses is ENGL. Each entry on the open class list tells the time and day(s) each class will meet (note that “R” means “Thursday”), and the building and room number in which the class will meet. Summer orientation will assist in your transition to college by helping you meet other new students, become acquainted with the campus and its services, and register for classes before the fall semester. 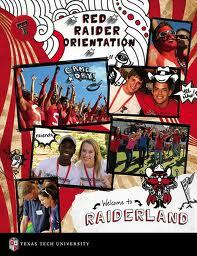 If you have questions about Red Raider Orientation (RRO), call the Center for Campus Life at (806) 742-5433. All new students will meet with the advisor for Terry Advising on at 9am prior to check in on day 1. Refer to your initial email from Heather Medley or the RRO Webpage HERE for details. Your orientation agenda and advising appointments will be created based on the major listed for you on MyTech. If the major listed is inaccurate, go the following website to switch your major to the degree you actually want to pursue. Please take care of this prior to attending summer orientation to make your time on campus as efficient as possible.